Updated December 5, 2018: Samsung’s latest One UI Beta program based on Android 9 is now live for the Galaxy Note 9 – Snapdragon, Exynos, and unlocked variants. Here we have the official Android 9.0 Pie update zip for the Unlocked Note 9 US variant along with the previously available alpha build for the non-unlocked Snapdragon variant. It features the new firmware build number N960U1UEU1ZRKP for the Note 9 SM-N960U1 variant , with Baseband version N960U1OYM1ZRKP. Original post: Following the leaks of One UI, formerly known as Samsung Experience 10 firmware update, for S-series phones, the same is now available for the latest Note series flagship. Yes, the Samsung Galaxy Note 9 now gets Android 9.0 Pie firmware update as well. This is a leaked Beta update for Android P available via OTA. So download the OTA zip and see how to update Galaxy Note 9 to Android 9.0 Pie based on Samsung Experience 10 with build number N960USQU1CRJ1. The new Samsung Experience 10 for the Note 9 (SM-N960U/U1) comes with a new firmware build number N960USQU1CRJ1. As usual, Samsung’s Android 9.0 Pie Beta is exclusive to the United States variants for now. So only the Snapdragon variants of the Galaxy Note 9 (SM-G960U) and Unlocked Note 9 (SM-G965U1) can install the OTA update and thus upgrade to Android P.
It features all the Android P goodies such as Adaptive Battery, Adaptive Brightness, Slice, Actions, Night Mode, revamped UI across the system and much more. Though it may not include Google’s swipe gestures from Pixel phones. Samsung already has a solution of its own called Edge Gestures with Good Lock 2018 plugin via One Hand Operations +. 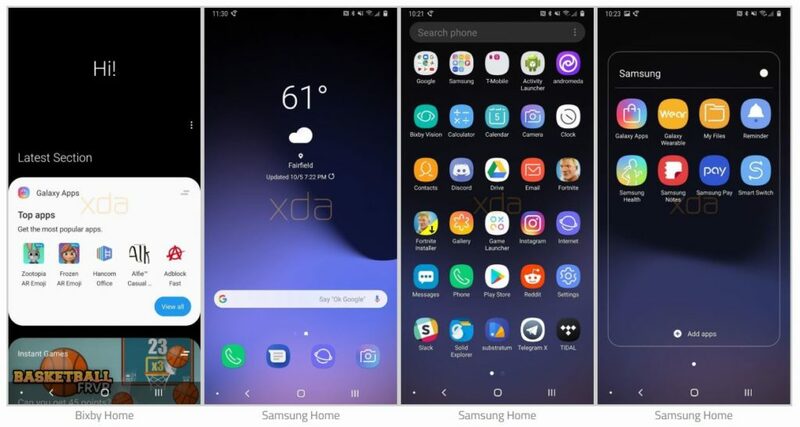 Thanks to XDA Developers and SamMobile, here we have some screenshots of the latest Android 9.0 Pie leaked Beta based on Samsung Experience 10. Following is the official Android 9.0 Pie OTA update.zip for the unlocked Note 9. You can use it on any unlocked variant running on stock firmware build N960U1UES1ARJ9. Alternatively, you can convert your locked device by flashing the ARJ9 and latest flash the One UI beta OTA update zip from below. This is an early build of the Android 9 Pie based on SE 10 for Galaxy Note 9. So you may expect some bugs. Moreover, the OTA is for the Snapdragon variants only. Do not try it on Exynos. Also note that in order to get back to Android 8.0 Oreo, you will need to clean flash full stock firmware via Odin. In order to update, your device needs to be on the full stock firmware with build number N960U1UES1ARJ9 based on Android 8.1 Oreo. If not, then you will also need to perform a clean firmware flash using Odin. See how to download latest stock firmware for Samsung devices here. Later, flash the Android 9.0 Pie OTA update zip via stock recovery or ADB sideload method for Android 9.0 Pie with build number N960U1UEU1ZRKP. Make sure your device is a Snapdragon Note 9 variant. Step 1: First, flash the N960U1UES1ARJ9 stock firmware build onto your Note 9 device. If your phone is already on that build, skip this step and proceed. Soon the official Samsung Beta Program will start for the United States with Snapdragon variants. Later beta update will roll out for Exynos variants after a couple of Beta OTA updates for S9 (SM-G960F/FD) and S9 Plus (SM-G965F/FD), and even the Note 9 (via leaks). So stay tuned. Thanks to Samsung Firmware Science for the OTA.